If a zombie walked into a bar, he would order a Brain Hemorrhage. He might also eat the bartender’s actual brains, but we’ll stop our zombie journey at the drink, which is the perfect shot for Halloween parties. 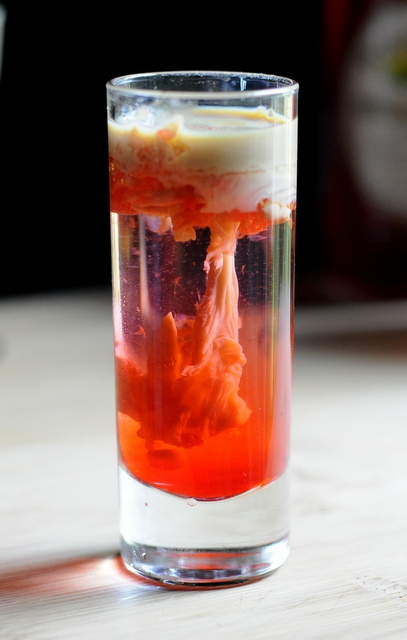 I prefer to think of it as a Zombie Brain Hemorrhage simply because it looks like what I imagine zombie brains would look like: very, very gross. The drink also feels weird in your mouth – but unlike actual zombie brains, it tastes surprisingly good. The drink is made with peach schnapps and Irish cream. The peach schnapps are poured into the shot glass first, then the Irish cream is layered on top. 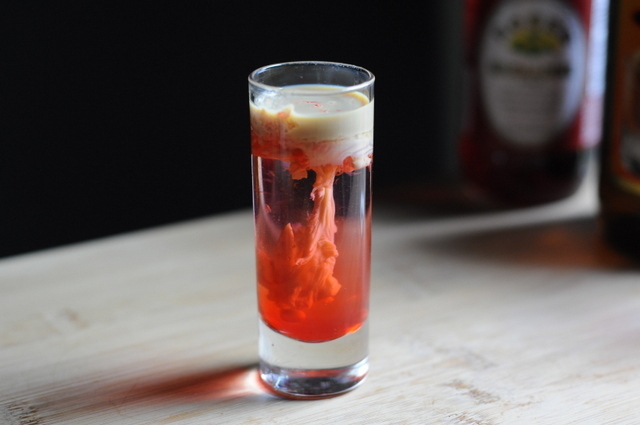 To get the brain effect, a splash of grenadine is poured straight down through the Irish cream. Rose’s Grenadine contains citric acid and that curdles the cream (and makes it a bit lumpy – hence the odd texture, though it is still perfectly tasty) and creates the look of brains. Pour the peach schnapps into a shot glass. Over the back of a spoon, layer the Bailey’s Irish Cream. Hold the bottle of grenadine about 2 inches over the shot glass and slowly pour it in a thin stream. The Bailey’s will curdle and form “brains”. If you like this drink check out the Green Monster Shot or the Bloody Finger. This looks so creepy… and yet, I can’t wait to try it. Just have to pick up some peach schnapps first!